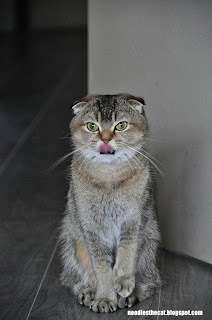 I IZ NOODLES THE CAT: Dinner ready? Is dinner ready? I'm hungry, so hurry up! You only have to open a can. Noodles, our ManHuman is giving us extra lunchtime noms. Why don't you teleport over and have some with us?